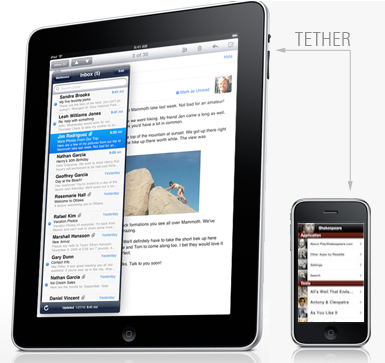 TechFlash is reporting that they have received email confirmation from AT&T that despite the carrier’s announcement yesterday that they will allow iPhone tethering, that does not include the iPad. From what TechFlash is saying, AT&T actually hasn’t technically ruled against tethering of the iPhone to an iPad, they just point out that there is not USB connection for an iPad (or iPhone to iPad cable) so tethering is impossible. Also, TechFlash also mentions this comment that points out that the iPad’s Bluetooth settings are not enabled for tethering either (which confirms my doubts that I tweeted earlier today). So it seems that if someone can come up with an iPhone to iPad cable that enables tethering (if that is possible) then AT&T would have to either allow the tethering or come back with a clearer “no” against tethering the iPad. But for now, this seems to confirm what many already suspected.